Length and contours are the two most important things that you might watch out for when you are trying to trim or style your beard/stubble. However, it is exactly these two points that fail you most of the times. How many times have you felt disappointed at not having achieved the style that you wanted? If you have been worrying about these problems, here is some good news for you. Braun BT5010 Beard Trimmer is one of the new-age tools that will help you get the most from your beard. Let’s take a look at the features of this trimmer to know more about this product. Comes with a 2-pin. If you are in the UK you will need an adapter. Very handy to use as it can be used both as corded and cordless, so you will never run out of power halfway through trimming. Some reviewers say this is a much better stubble trimmer than beard trimmer, due to the length settings not accommodating a longer beard than 1 centimetre. If you are look to use this to shave your bald head you would still need to go over your head with a razor afterwards, because it will not do a good enough job. 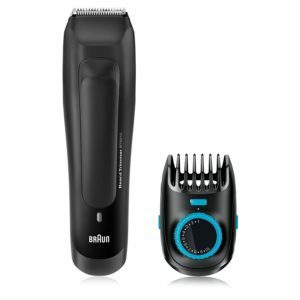 If you are looking for a low-priced trimmer that does the job the Braun BT5010 model is the right choice for you. Use the high-performance and ultra-sharp blades for maximum efficiency, different hairstyles and perfect trimming of your stubble. This trimmer is priced competitively, but it is also very handy to use and maintain. You can clean the blades and trimmer with running water. It currently has 4.0 out of 5 stars on a smaller number of reviews. 75% of the reviews are 4 stars or higher which puts it towards the lower end of this metric. This is a very good trimmer if you want to maintain a shorter beard, goatee, or moustache, and for the price it will serve you well. This is one of the top 20 selling beard trimmers online. 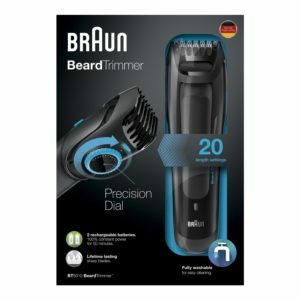 However, if you are looking to grow your beard out you will want to look through some of the other reviews we have for beard trimmers which may be more appropriate for a long beard, like the Braun BT5050 Beard Trimmer Review. The BT5050 allows you to trim up to lengths of 2 centimetres (20mm).